On Sunday July 31st, 2011, Bill and I began an incredible volunteer journey alongside the Karla Smith Foundation, BringChange2Mind and ABC’s Extreme Makeover: Home Edition and thousands of other volunteers helping build a new home for an amazing wounded warrior and his family. After that incredible experience we had no idea that within seven months we would return to the build site but this time with a special project for the Hill’s. 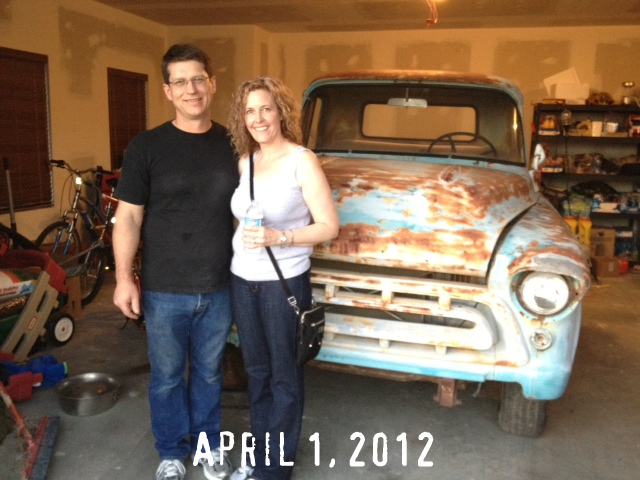 After the build, Bill and Allen met and discovered they have a similar passion for older Chevy pickups. Allen lit up when he described the perfect pickup to Bill; a 1957 Chevy, 3100, short-bed, step-side with the wrap-around back window option. So what does a friend do for a friend? He goes on a journey to find a project pickup! And with that Bill set out on a journey to find Allen a restorable 57’ Chevy pickup. Bill contacted anyone he knew that might be able to help. 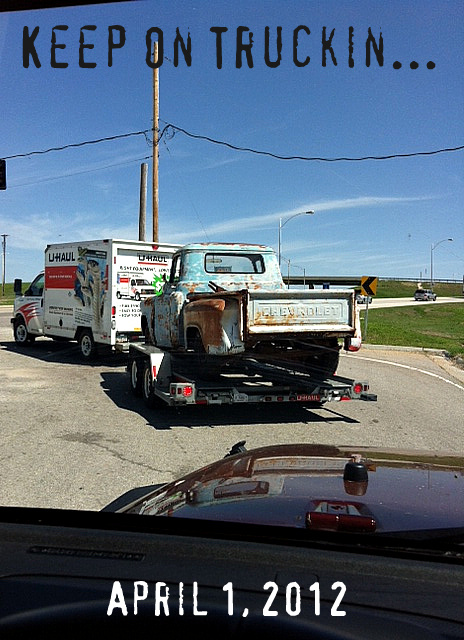 Our journey took Bill and I across the country looking at pickups in Indiana, Illinois, Missouri, Kansas and Oklahoma. 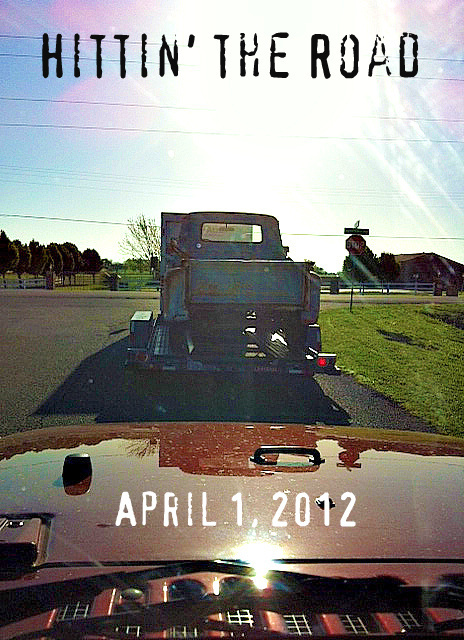 It was quite the adventure looking for the project pickup. In our travels we met many characters along the way and learned a lot about finding a good pickup. At one point, we found what we thought was the perfect candidate and even made an offer. However, as the owner went to retrieve the title, Bill went back to the pickup to look for the VIN number. Much to Bill’s surprise, the VIN plate was missing, and he then discovered that the hidden VIN plate had also been removed. We had such disappointment as we were so close and really liked that pickup. Other pickups that we looked at had extensive rust, extreme mechanical issues, damage, or missing titles and VINs. And other pickups listed online that looked promising would sell almost as soon as they were listed. However, each time Bill found another pickup to look at, he had renewed energy, and off we would go to another state with hopes high! The journey continued and we had hopes of finding a pickup locally and definitely wanted to locate the project before Bill’s next work trip to China. 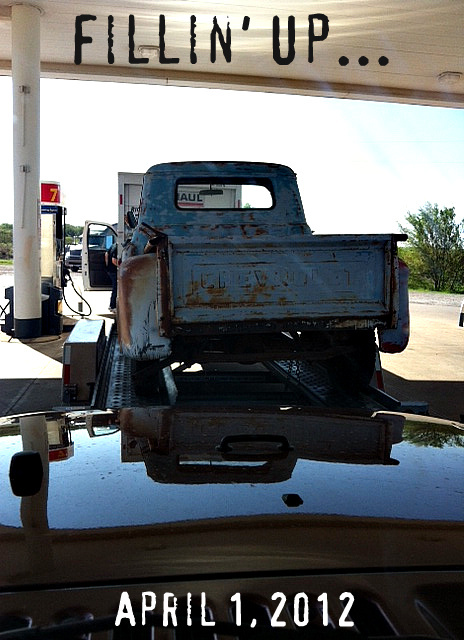 As Bill planned for another weekend of looking at pickups, Bill found a promising ad for a 57’ in Oklahoma. This pickup was very distant from us and had no pictures so Bill and I were not very positive about it. Interestingly enough though, it was very near to where my Mom and Dad live! Since it was hundreds of miles from where we live they went and checked the truck out and took pictures for us as well. After Bill saw the pictures a deal was made and just like that we had a truck! By Friday Bill and I were on the road and headed to my Mom’s. I hadn’t seen my Mom for a few years so it was a blessing that the truck was where it was. Like a whirlwind we blew into Oklahoma! We thoroughly enjoyed our time with Mom and Dad and then the following morning made our trek out to the seller’s home. Once at the house we walked to the back to see the truck. There it was in all its glory sitting pretty and just waiting for us to take it home to Allen and on to its new journey. After visiting with the seller we finalized the deal and loaded the truck up. That was an experience! I had the privilege of getting to ride the truck up onto the U-Haul trailer as Bill, the seller and the seller’s daughter all pushed. It was so awesome! With the truck loaded we headed out toward Ottawa. I followed Bill in my Jeep. I can’t tell you how excited I was to be taking the truck to its new home! I noticed, as I followed along, that the faded colors were red, white and blue. The original color of the truck appears to be blue. However, the paint is all but gone at this point and time, even so it looks cool! Along the way Bill and I made few pit stops because we were excited to get it home to Allen. We didn’t want to mess around. When we stopped for gas I shared with Bill that I felt happy. This is unusual lately since I have had so much arthritis pain. But I felt truly happy. 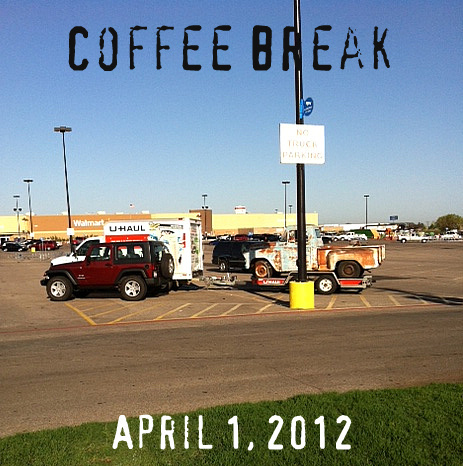 Bill said the same thing, and we finished fueling up and got back on the road. As I followed behind I felt so proud of our find. I also felt great love, respect and appreciation for my parents for assisting us with the search. I took several pictures on our way because I wanted to share with Gina and Allen the trucks journey to their home. The picture above was from one of our coffee breaks. What is really exciting is that the truck is on a new journey! We had one tiny part in that journey, and now Allen and the boys will restore it. Allen has told us that he wants to get it back to its original glory! I especially like the picture of the truck traveling along on the last road to the Hill’s home. It’s like the dust that was kicked up behind it was a grand curtain. 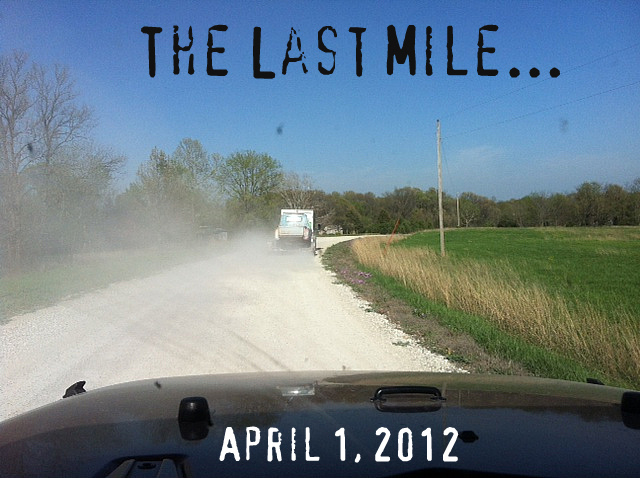 As we pulled into the driveway the dust settled. The curtains pulled back so to speak, and there we sat. During the moments we waited for the Hill’s to come outside I remember feeling happy and also curious. Bill and I were hoping it was what Allen wanted. And it was! Gina, Allen, Makale and Dreyson walked outside and with that Allen smiled a smile so big that I knew he loved it. As we started looking over the pickup with Allen, Gina’s Dad came by to help us unload it. Bill had worked with Gina’s Dad in Joplin and was glad to see him! I know why this project was so important to Bill but many of you reading this may not. It just happens that Bill’s first car was a 57’ pickup, exactly what Allen described as his dream pickup. Bill’s Dad bought the pickup for Bill’s 13th Birthday, and he will never forget how special a gift it was. Bill gave up his pickup so he would have a better work car. That didn’t work out so well, but such is life. And there was always a special place in Bill’s heart and mine for these pickups. So when Allen and Bill met and started talking pickups the spark was lit, and Bill knew what he had to do. Bill’s hope was and is that Allen will continue to heal and improve and that having a project to do will somehow assist in that. It is also healing for Bill and is finally giving him the opportunity to do what he really wanted to do with his pickup, which was share it with someone who really loves these pickups and wants to restore it to its original condition. Allen is an amazing man and is a hero to Bill. Just that Allen was able to serve his country and has overcome so many of his internal and external injuries is an inspiration and makes Bill and I want to be better people and give back in ways that we never dreamed of. We have been blessed to be a small part of incredible experiences over the past couple of years, and we are inspired to continue volunteering and doing whatever we can. Our incredible journey now links to so many other incredible journeys, and now the Hill’s and an Infantry Blue 1957 Chevrolet pickup are on a new and amazing journey!